The main objective of the TNT project is to examine different potentials for a cultural arena; understood as a public space where Citizen and Institution meet to define collective ideas of identity, ethics and social imagination. I was asked by the Royal Danish Theatre if I was interested in making a double bill production at the small stage. The two productions would share scenography, and were to be the only performances produced for that year. As a way for the theatre to save money, the proposal was obviously of minimal artistic interest. So, instead a deal was made with the direction that all money from the original budget not being used on making finalized theatre/representations - scenography, costume, lightdesign etc - would be available for us to invest in a curational programming of the space. Conventionally theatre spaces are dormant most of the time, becoming active briefly for some three hours each day when something is being performed. What if instead these spaces were to become active twentyone hours daily? 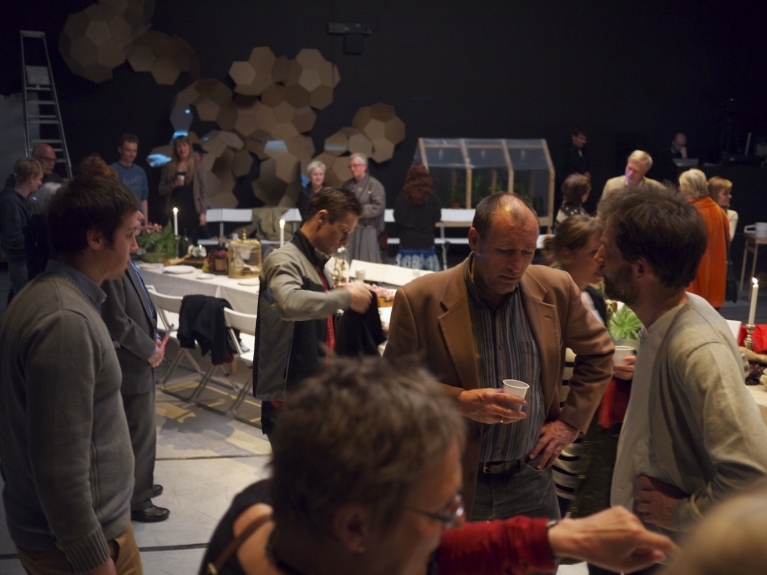 For the season 2009/10 the Lille Scene was conceptualized as a transformative space – a Temporary National Theatre. In the fall 2009, the production Himmelweg prepared the arena with a series of seminars (fx six lessons in arab) and the period ended up with a grand final festival week (1-5/12), arranged by the famous crew from Asyl Dialog Tank and Trampolin House and organized by artist Joachim Hamou. For five days, the space house seminars, concerts, more arab lessons, choir-singing, performances etc. The program developed together with the community of people seeking asylum in Denmark, and made the Royal Theatre available and useful for people who normally wouldn't have known of its existence. During the spring 2010 we intensified the collective practice of the work. During six weeks, performed narratives from different short-stories of Franz Kafka encountered programmed events in a collaboratoral process of testing possible strategies for temporary transformations of a national scene into a People´s Palace. Over a period of 6 weeks, the space transformed into a crossing point between representational practice and knowledge production. Every night was initiated by a 60 minute theatre performance (KAFAK), where the narrative of animal-becoming in the literature of Franz Kafka was explored in a continous investigation of the thematical keystones Power, Identity and Representation. After this introduction, the room was handed over to guesting artists, researchers, philosophers, workshops, seminars, social activities etc. For these events, TNT offered moveable walls, lighting, chairs, tables, projectors and projection screens, a PA-system, a simple kitchen and a small garden. The ambition was to provide the space with the conditions needed to have it used as much as possible; a venue in constant transformation. The more different perspectives and diversified expertise, experience and strategies that filled up the space, the more impossible it got for one identity to claim souvereign power over the space and it´s representations. Already that was a success.